The 244th meeting of the NY Comics & Picture-story Symposium will be held at Parsons School of Design. 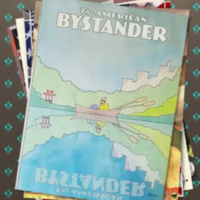 Editor & Publisher Michael Gerber and a panel of contributing cartoonists and writers discuss The American Bystander and its place in the tradition of print humor magazines in the US and internationally. Presented by Parsons School of Design and The School of Art, Media, and Technology.